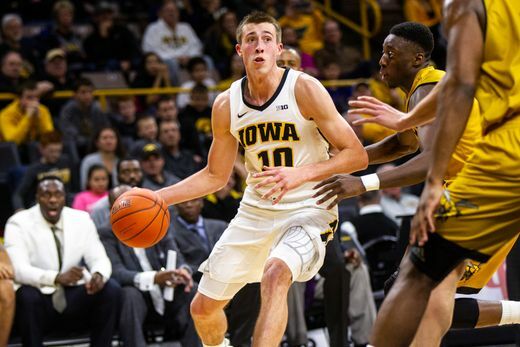 The Hawkeyes started off lightning quick as they ran out to a 17-4 lead by the Under-16 media timeout. It would only get worse from their. Luka Garza led all scorers with 22 points, going 8-8 from the field and going 5-6 from the free throw line. Garza and Cook led the Hawkeyes in scoring with Tyler Cook trailing behind with 15 points and a couple of nice dunks in the half-court set. Isaiah Moss, who had struggled in New York during the Empire 2K Classic, came to life in front of the home fans, scoring 15 points, knocking down three of four, three-pointers, and a beautiful fast-break dunk in the first half. It was also a big night for the Iowa walk-ons as all four of them saw playing time: Riley Till, Austin Ash, Nicholas Hobbs and Michael Baer. 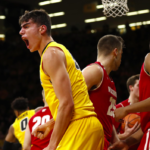 Austin Ash scored his first career points as a Hawkeye on three-pointer with 4:17 to go in the ball game, and the crowd very nearly took the roof off Carver-Hawkeye Arena is Ash’s follow up three-pointer would have fallen. 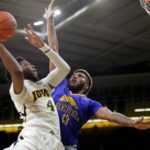 Iowa now begins a crucial four-game stretch starting with their matchup against the Pitt Panthers in the Big Ten-ACC Challenge on November 27th. 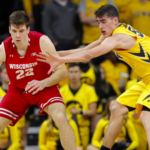 “You’ve got four monsters coming up, but I don’t look at it that way, I look at it as one monster coming up, and we’ll worry about the ones after that,” Fran McCaffery said of the four-game slate against Pitt, Wisconsin, Michigan State and Iowa State. Iowa’s next match-up is against Pitt in the Big Ten-ACC Challenge on Tuesday, November 27th at 8:00 PM on ESPNU.